ASM has maintained its position in the Band 2 ranks in the latest edition of Chambers USA for its fourth year in a row. Clients are quoted as saying “The team has an incredible knowledge of construction law. Their biggest asset is that they provide very practical and business-minded solutions to legal problems.” Chambers also recognizes Chuck Asmar, Larry Schor, John McKenna & Chris Taggi individually for their outstanding contributions to the field of construction law. 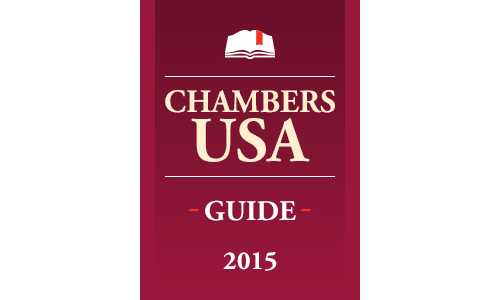 Chambers is one of the most widely used and highly regarded resources for identifying leading attorneys across the United States and internationally. This Website is not intended to create a lawyer-client relationship between you and Asmar, Schor & McKenna PLLC and/or its attorneys. You should not act or rely on information in this Website without seeking the advice of a lawyer. If you are interested in having Asmar, Schor & McKenna PLLC represent you in a legal matter, please contact us at 202-244-4264.